The Karnataka beaches are all bathed in a celestial cascade of beauty, not known to many other beach destinations. One of the firsts that spring to the memory at the very mention of these beaches is Malpe. A sheer 6 km from the pilgrim jaunt Udupi, Malpe reminds one of the 'Blue Lagoon' love-lore. The endless stretch of gilded sand, swaying palm trees, sapphire sky and the gentle murmur of the sea set the perfect mood for an idyllic holiday. Between October and January, it is what can only be called - heaven. Besides, Malpe's topography, that positions itself as a beach town where the river Udyavar meets the Arabian Sea, makes it a viable fishing port. Infact, Malpe is one of Karnataka Fisheries major joints. 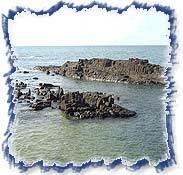 The Islands- Just a boat ride away from Malpe are three rocky islands - Daria-Bahadurgad, Kari-Illada-Kallu and Daria-Gadara-Kalluthe. The Daria-Bahadurgad port is famous for its export of processed fish to foreign countries. Don't forget to check out the oldest tile factory set up by the Basel Mission exists here. The ports form idyllic spots for boating and fishing activities. St Mary's Island is specially famed for being one of the most popular picnicking paradise. Here is a cluster of volcanic rocks waiting to be explored. For The Religious- The temples of Lord Balarama and Ananteshwara are frequented by believers on their trip to Malpe. The image of Balarama has six faces. Perhaps this was originally a temple of Subramanya or Shanmukha, the six-faced deity who was named Balarama at a later date. Beach Resorts - Close to Malpe is Ullal, a maritime beach resort, the silvery beaches of which command breathtaking views of the sunset, especially, when viewed through the casuarina groves. Air - Bajpe (Mangalore) is the nearest airport. Rail - Udupi at 6 km is the nearest railhead. Road - Udupi is 6 km, at 392 km is Bangalore and Mangalore is 66 km. With Top Travel Tours, accommodation can never be a problem. Advanced bookings can be done. Options abound in the nearby populous town Udupi.